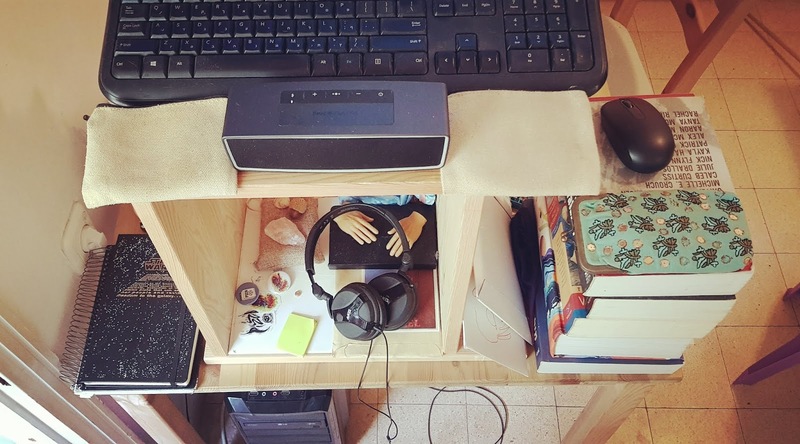 I recently began using an improvised stand-up desk because I had injured my leg and read online that prolonged sitting would prevent recovery. So now I’m on my feet a lot of the time that I’m in front of a computer, which is honestly a big change when it comes to the way I approach writing. I haven’t stood in front of a computer terminal this long since I worked in retail. In fact, my brother, who works at the same bookstore where I used to, saw me at the stand-up desk and said I looked like I was the manager. So that’s my physical position vis-à-vis my writing day, at least for now. My hamstrings may have the final say in this. As far as routine goes, this is a weird time for me. I just finished a long project that I’d been working on since 2013 and am in the early early stages of working on a novel. The manuscript of the long project is out with a few different publishers; if it gets picked up I know there’s going to be a lot of work involved in editing it, so I can’t really put it out of my mind. But the novel is going to be something so different from the previous things I’ve written, I’m still trying to find a way into it. Mostly my writing day is currently about me wondering about fundamental events in a narrative I haven’t really sketched out yet. That’s why, in addition to the stand-up desk, I started a new notebook devoted entirely to the novel. Just to mess around. Because I’ve tried to write two novels previous to this attempt, I don’t want to fail the same way. I know streamlining the process is going to be a big part of its writing success. But it’s hard to do that without much material. So I need to just woolgather for a while, and I feel like that might be a little bit easier to do off of my feet. Hence the notebook. Like I told rob mclennan when he asked me to contribute to this series, I’m not one of the write-every-day advocates. But when I do set out to actually get any work done, on any project, my writing day really doesn’t begin until most people are asleep. I might be able to throw a bunch of words down on the page in the morning if I’m not busy with work and the kids, but I really get most motivated and focused to write when there are a lot fewer distractions, and that means late at night. This isn’t a personal dig at my wife and kids, who I love to be around and share my time with—I’ve always been a night owl when it comes to writing. Way back when I was in my earliest twenties I tried to double down on this tendency and would brew a disgusting four-scoop instant coffee with as little milk as possible to stay up as late as I could to get the most writing done, with results you would expect. Now I know enough about my natural rhythms at work to know that unless it’s immediately urgent to get down on paper, I am most productive between 12:00-2:00AM. I used to push it to 4AM, but I’m a lot more careful with taking care of myself these days. Sometimes I’ll spend the whole time I’m up not writing, and only when I’m about to get ready to call it a night, shutting things down, turning off do I get a sentence or an image. It’s ten minutes of writing but an investment of four or five hours to get it, but it’s worth it. Anthony Michael Morena is a writer from New York who lives in Tel Aviv. He is the author of The Voyager Record: A Transmission (Rose Metal Press, 2016) and assistant fiction editor for Gigantic Sequins. His writing has appeared in The Establishment, Ninth Letter, Flapperhouse, Hobart, The Mondegreen, and The Ilanot Review, where he has also been a guest editor and interviewer. Find him on Twitter @anphimimor and at anthonymichaelmorena.com.